On April 5, 2012, 15 year old Shiv lay bleeding on a busy road in New Delhi after being hit by an unidentified vehicle. Scores of passersby stopped but none came forward to assist him even as the boy pleaded for help. By the time the first police car reached him, 45 minutes had passed and Shiv was already dead. The death of a loved one always comes with shock, but that shock ceases to fade when it could have been prevented. Nearly 150,000 people in India are killed each year in road crashes, many of them dying from treatable injuries. The Law Commission of India states that 50 percent of deaths in road crashes in India can be averted if victims were to get even basic care on time. With over one million road crash deaths in India in the past decade alone, this translates to half-a-million people whose lives could have been saved. In the absence of an established Emergency Medical Services system, bystanders and passersby can play a crucial role in saving lives. Yet, in India, they don’t – mostly out of fear of police harassment and prolonged court cases. 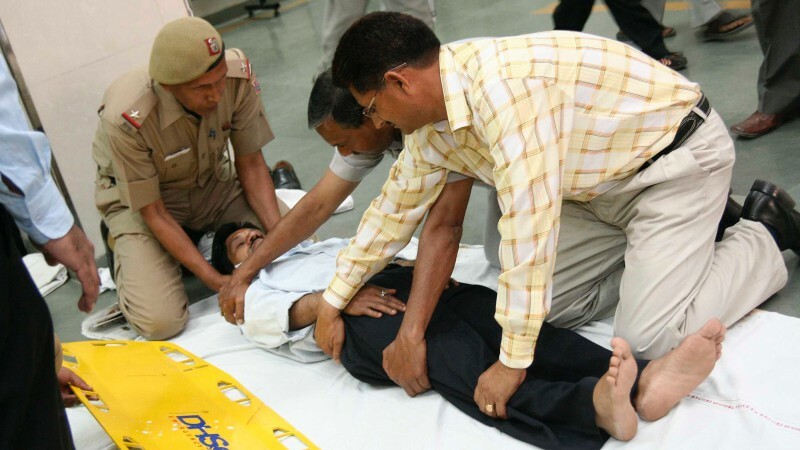 According to the World Health Organization report Prehospital Trauma Care Systems, “Bystanders must feel both empowered to act and confident they will not suffer adverse consequences, such as legal liability, as a result of aiding someone who has been injured.” Given that the nucleus of the issue was the absence of a supportive legal framework for “Bystander Care”, the ask of SaveLIFE Foundation was comprehensive protection for Good Samaritans – from police intimidation as well as the ensuing legal and procedural hassles. To seek this framework, SaveLIFE Foundation launched a nationwide campaign in 2012, with support from Bloomberg Philanthropies and Global Road Safety Partnership. In a national study, conducted as part of the campaign, it was revealed that 3 out of 4 people in India were hesitant to help road crash victims, of which 88 percent said it was due to fear of legal and procedural hassles. Choosing a Public-Interest Litigation as the preferred tool for desired change, SaveLIFE Foundation filed a “Writ Petition” in the Supreme Court in May 2012 invoking Article 21 of the Indian Constitution that guarantees Right to Life. The Government of India, unfortunately, opposed the petition in court stating that the current procedures being followed by police – construed as harassment – were as laid down under the law. The court, however, formed a committee in December 2012 to look into the matter objectively. While the committee considered the issue, the advocacy campaign being run in parallel led to several milestones. 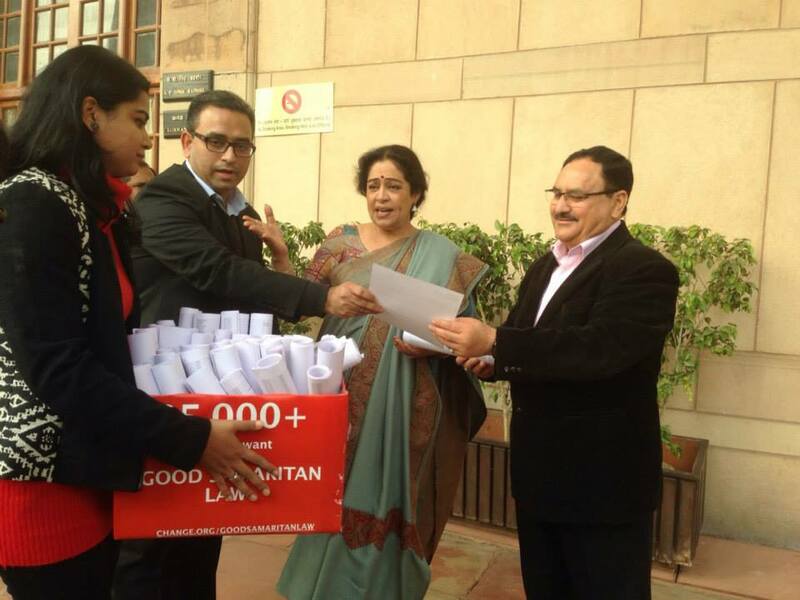 These included multiple questions on the issue being raised in the Indian Parliament, a petition signed by 100,000 people delivered directly to the Health Minister of India, a concerted media campaign, and even a Private Member Bill in the Parliament that directly questioned the government’s stand on the issue. 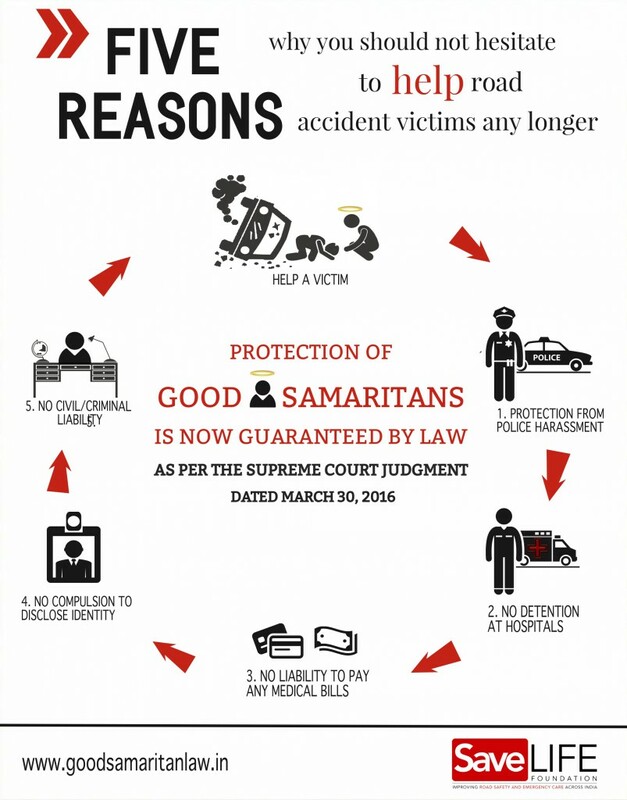 “Good Samaritan Law” had become a buzzword for the first time in India with even celebrity talk shows discussing the issue. After months of deliberations, the Supreme Court appointed committee recommended widespread judicial reforms in its January 2014 report to protect Good Samaritans. Combined with the ongoing advocacy campaign it created urgency around the issue. By this time a new government had been sworn in, and they noted the public sentiment generated around the issue as well as the recommendations of the Supreme Court committee. On October 27, 2014, the Government of India filed an affidavit in the Supreme Court submitting that they support the issue and are willing to draft a detailed policy, which they did and was released on May 12, 2015. On March 30, 2016, the Supreme Court of India exercised its special powers under Article 141 of the Constitution and converted the policy into a law, binding on all States and Union Territories of India. This crucial reform has given India a unique opportunity to save at least 500,000 lives over the next decade by ensuring that those injured get immediate assistance from Good Samaritans. It is now time for the country to act on the prevention of road crashes as well and reform its archaic legislation governing road safety. Bloomberg Philanthropies and Global Road Safety Partnership continue to support SaveLIFE Foundation and other civil society organizations in India to push for a strengthened road safety law that will protect all road users and save lives. Piyush Tewari is the Founder & CEO of SaveLIFE Foundation, a non-profit, non-governmental organisation committed to improving Road Safety and Emergency Medical Care in India.